As Sunday morning B-League matches go this was an absolute cracker as Ballinlough eventually seen off Skyrne in Division 5 of the B-League in Ballinlough. With promotion within the grasp of both teams this was always likely to be a lively affair and it went right down to the wire as Ballinlough fared better in the last ten minutes to put themselves within one match of promotion and a final appearance. 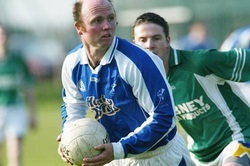 Skyrne contained plenty of experience in their team including former Keegan Cup winners John Quinn (pictured above) and James Looby and both players made a significant contribution to their team, but Ballinlough’s better balanced team performance was the main reason for their win. Ballinlough had taken an early 0-3 to 0-1 point lead with points from James O’ Higgins, Jonnie Reilly and Ken Rothwell (free) but Skyrne replied to level it with a couple of long range frees from James Looby and Jamie Jordan. The home side replied with the last two scores of the half from Jack Tunney and James O’ Higgins to lead; 0-5 to 0-3, at half time. However while Ballinlough had plenty of possession in the first couple of minutes of the second half they didn’t add to their tally and then they found themselves in arrears when John Quinn found Cyril Carty in space and he finished to the net to put his team ahead; 1-3 to 0-5, after 34 minutes. Skyrne had grabbed the initiative and they found themselves a goal ahead when Jamie Jordan slotted over a couple of points in quick succession. At this stage Ballinlough were struggling but Simon Deevy entered the fray and he made and instant impact pointing after the outstanding Jonnie Reilly had done most of the hard work, this was the catalyst for a good spell for ‘The Lough’ as Reilly, Ken Rothwell and Conor Briody pointed to put them ahead; 0-9 to 1-5, after 45 minutes. A point looked on when Ken Rothwell lined-up to take a 30 meter free but the ball fell short and deceived the Skyrne defence going straight to the net leaving Ballinlough four points ahead. But just when it looked as if Ballinlough were in the driving seat they were hit with another blow as James Looby was involved in setting up John Quinn who rattled the net for the visitors, Jamie Jordan followed up with another point leaving just one point between the sides; 2-6 to 1-10, with ten minutes remaining. At this stage the Ballinlough management team made a couple of astute positional switches as Simon Deevy moved to midfield and Ken Rothwell moved to centre half forward and along with impressive midfielder Gary Reilly they won some vital possession as they finished well with points from Rothwell (two frees) and Deevy while Skyrne could only register one more point as the home team ran out four point winners. A win over Moylagh in Ballinlough’s final match would assure them of promotion and a place in the Division 5 B-League final. Ballinlough: M. Brady, P. Baugh, K. Devine, Jonathon O’ Reilly, P. Farrelly, M. Geraghty, J. Baugh, N. Farrelly, G. Reilly, J. Reilly (0-2), C. Briody (0-1), J. Tunney (0-1), J. O’ Higgins (0-3), K, Rothwell (1-4f), D. Farrelly. Subs: S. Deevy (0-2) for Tunney, Junior O’ Reilly for Farrelly and N. Finlay for Briody.